Have you ever been tempted to assume you understand the message of a familiar Gospel? A default sort of subconscious way of categorizing—neatly—what we think the message says. Today’s text is that kind of example for me. I have usually assumed that Jesus is calling out or criticizing the Pharisees for their hypocritical judgements; “don’t be so preoccupied with outward appearances but rather be sure you’re keeping your heart clean or pure.” I might suggest we’ve often experienced people in our own world who seem preoccupied with judging others and I used to think—those people need to hear this! Yet, Scripture is the living word and if I’m not listening deeply to new ways of understanding the text where is the life in that? Where is the growth? More recently, I’ve been looking at this through the frame of the Pharisees, and I feel an empathy for their challenge and struggle. Its as if suddenly their purity laws are up for debate; what about their martyrs who died rather than eat unclean food? Is Jesus saying they died for nothing? That would be hard to accept and very confusing for his audience. So, what does Mark want his first audience to understand? Much has been written about the early struggles of the church. The Apostle Paul addresses these issues in many of his letters; the blending of Gentile and Jewish cultures was a huge challenge. Our clue comes from the very next section of this Gospel—The Syrophoenician Woman who challenges Jesus to give her the crumbs from the table of the chosen people (7:24-29). Might it be possible here that Mark has Jesus speaking to the early Jewish Christians about inclusion of the Gentiles? Therefore, the conversation about all foods being declared clean (v. 19) indicates the current reality of the early church. Paul takes this up in his letters to the Corinthians and Galatians. Jesus is the wholeness, the fulfillment of the Covenant with Israel, the purity laws were only guideposts leading to him. They were good and useful but not today. Now we press on with Metanoia—the changed mind; the Mind of Christ. 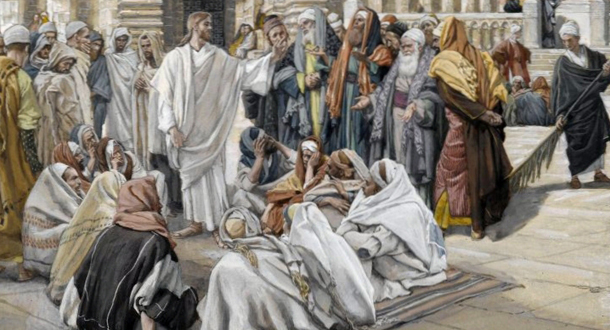 We look to the person of Jesus and how he taught his disciples and the crowds. We are not far from the kingdom when we help our neighbor, not for personal glorification but with a humble desire to care for the other. Where have I encountered the stranger this day? This may even be a family member. Who are the people you are being called to include? Jean Bowler is a retreatant at Mater Dolorosa Passionist Retreat Center in Sierra Madre, California, and a member of the Office of Mission Effectiveness Board of Holy Cross Province. Error: Error validating access token: Session has expired on Monday, 18-Mar-19 14:16:37 PDT. The current time is Thursday, 18-Apr-19 16:57:11 PDT.